HTML Pages - the interface between the user and MapServer . They normally sit in Web root. 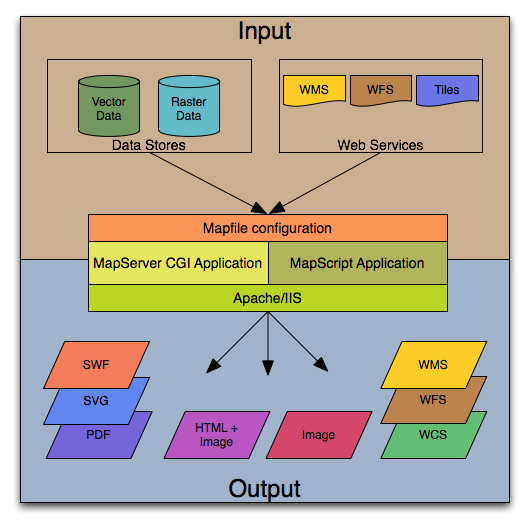 In it's simplest form, MapServer can be called to place a static map image on a HTML page. 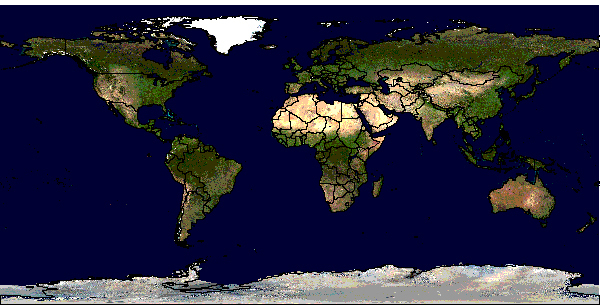 To make the map interactive, the image is placed in an HTML form on a page. CGI programs are 'stateless', every request they get is new and they don't remember anything about the last time that they were hit by your application. For this reason, every time your application sends a request to MapServer, it needs to pass context information (what layers are on, where you are on the map, application mode, etc.) in hidden form variables or URL variables. Web/HTTP Server - serves up the HTML pages when hit by the user's browser. 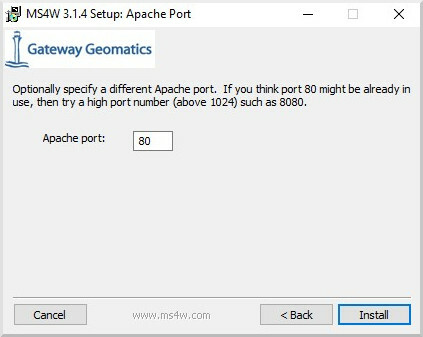 You need a working Web (HTTP) server, such as Apache or Microsoft Internet Information Server, on the machine on which you are installing MapServer. 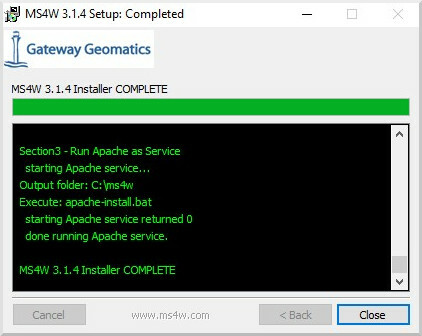 If you are on a Windows machine, and you don't have a web server installed, it is recommended that you use MS4W, which will install a pre-configured web server, MapServer, MapCache, PHP, TinyOWS, and many more utilities. 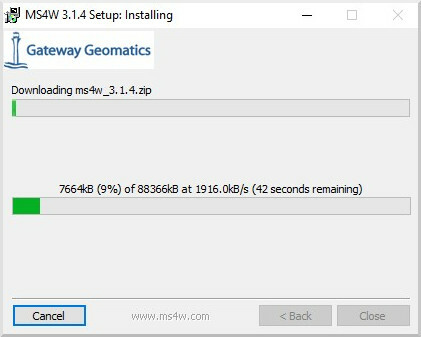 Windows users can optionally check out the OSGeo4W installer as well. 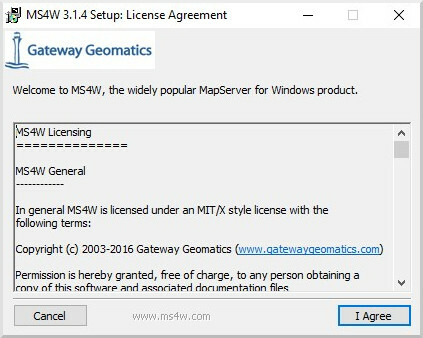 Click the "Agree" button, to accept the license. Select packages to install. Be sure to also select the " MapServer Itasca Demo Application ", as we will be using this demo later. Click the "Browse..." button, to choose an installation path. 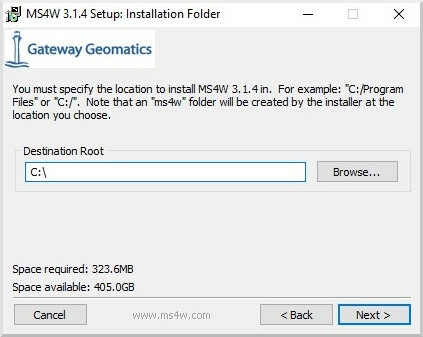 You can safely leave the default (C:/), and the installer will create C:/ms4w . On your desktop, click on the "MS4W-Localhost" shortcut, and your browser should open http://127.0.0.1 that loads an MS4W introduction page. Verify that MapServer is working, by clicking on the /cgi-bin/mapserv.exe link in the "Features" section of the page. 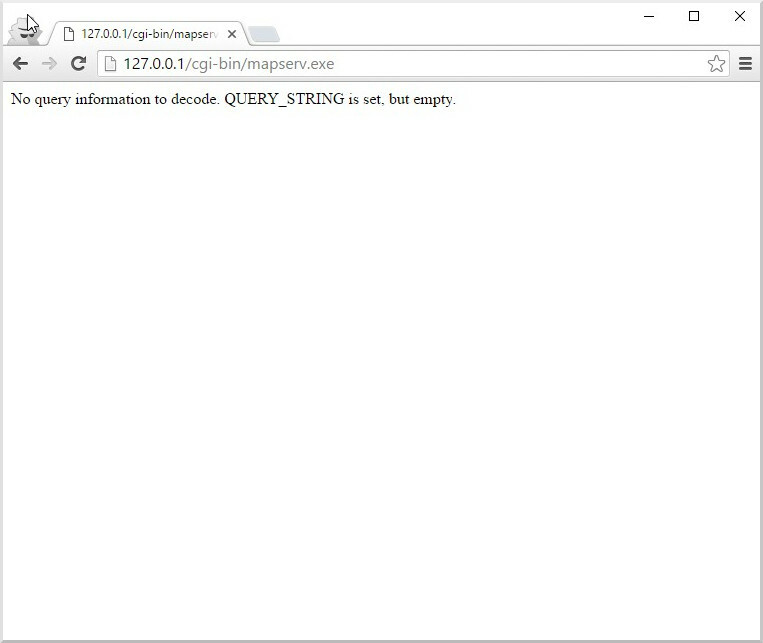 If MapServer is working properly, you will receive a message stating: " No query information to decode. QUERY_STRING is set, but empty. " 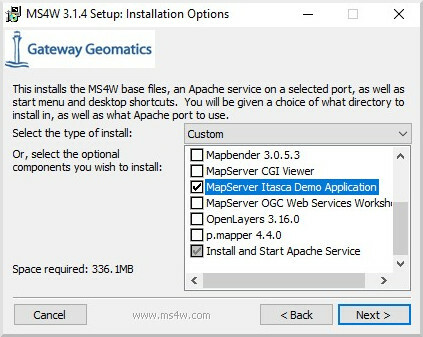 You can also send a HTTP request directly to the MapServer CGI program without passing any configuration variables (e.g. http://127.0.0.1/cgi-bin/mapserv.exe). If you receive the message, 'No query information to decode. QUERY_STRING not set. ', your installation is working. MS4W users do not have to do this step, as the above instructions already installed the demo. 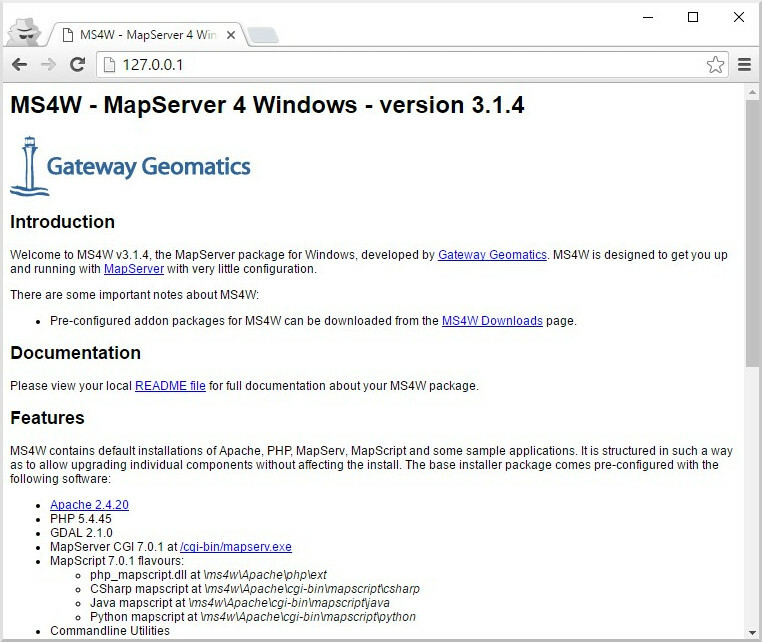 You should see a " MapServer Itasca Demo Application " section on the bottom of the page (after clicking the MS4W-Localhost shortcut). Download the MapServer Demo. UnZip it and follow the directions in ReadMe.txt. You will need to move the demo files to their appropriate locations on your web server, and modify the Map File and HTML pages to reflect the paths and URLs of your server. Next, point your browser to init.html and hit the 'initialize button'. If you get errors, verify that you have correctly modified the demo files. MapServer supports several data input formats 'natively', and many more if it is compiled with the Open Source libraries GDAL and OGR. The user selects features based on data associated with that feature. 'Show me all of the lakes where depth is greater than 100 feet', with 'depth' being a field in the Shape dataset or the spatial database. Attribute queries are accomplished by passing query definition information to MapServer in the URL (or form post). Mode=itemquery returns a single result, and mode=itemnquery returns multiple result sets. Tile Your Data - Ideally, your data will be 'sliced up' into pieces about the size in which it will be displayed. There is unnecessary overhead when searching through a large Shape dataset or image of which you are only going to display a small area. By breaking the data up into tiles and creating a tile index, MapServer only needs to open up and search the data files of interest. Shape datasets can be broken into smaller tiles and then a tileindex Shape dataset can be created using the tile4ms utility. 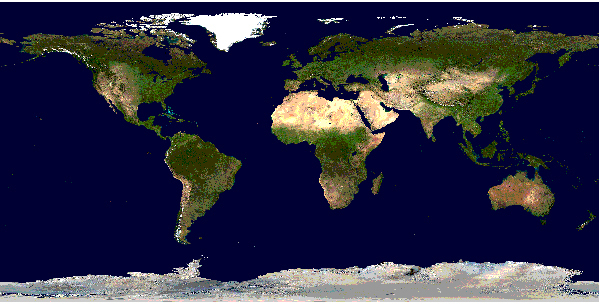 A tileindex Shape dataset for raster files can also be created.